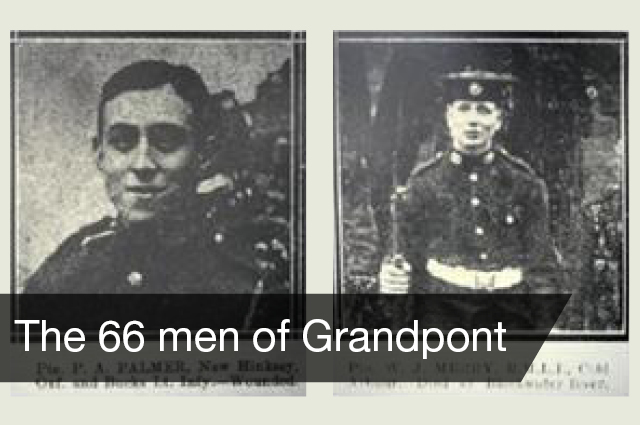 “I started the project of ‘The 66 men of Grandpont’ because I was intrigued by the names of the men that are etched into a memorial at St Matthew’s Church close to my house. A short time later I met a man who lives in Risinghurst and whose uncle, Horace Tallett, is named on the St Matthew’s war memorial. He, of course, knew a lot about his uncle’s war service, and that of his father Ken (who fought and survived), but he suggested that someone ought to research the lives of all the men named on the war memorial. Liz and her team have now decided to hold an annual commemorative event in the South Oxford Community Centre with an evening of music, poetry and film to honour the men from South Oxford on Friday 11th November. Performance programme starts at 6.30pm with poetry, music and a showing of a 40-minute documentary film. Click here to watch the trailer of the DVD which you can buy for £5.